I just found out this week that Diana Gabaldon has written a chapter in a multi-author mystery novel called NO REST FOR THE DEAD, due out on July 5, 2011. There is a list of the contributing authors here, and a thread about the book on Compuserve here. 3) since it's collaborative, the editor "smoothed" all the chapters, so the details would be congruent and the voice of the book not too different between chapters. 5) because of 3), I don't even know whether my chapter _sounds_ much like me. 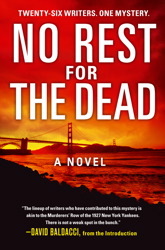 If you are in the New York area, there will be a multi-author signing for NO REST FOR THE DEAD on July 8th at the Center for Fiction, 17 E. 47th Street, at which Diana Gabaldon and a number of the other contributing authors will be appearing. Commenting about this event yesterday on Compuserve, Diana said, "Since this isn't a bookstore, my guess is that you could bring in your own books, but....I don't know for sure." Look here for details, if you're interested. I have never been much of a reader of mystery novels, and given Diana's comments above, I don't think I'm going to buy this one. But feel free to post here with your comments on the book, after it comes out on July 5th.